This week I am giving away a Nori Messenger Bag from Maranda Lee Handbags. Maranda is a friend of mine who is quite crafty. I am the lucky owner of two of her bags and I love them! The quality is impeccable and her patterns and fabrics are amazing. The Nori is Maranda's BRAND NEW bag. Be one of the first to carry one! This messenger easily fits your wallet, cell phone, sunglasses and more! The large slip pocket on the back is perfect for easy access to your keys, notepad, etc. *Large slip pocket on the back of the bag for easy access to items. *43" long strap perfect for over your shoulder or across your body. 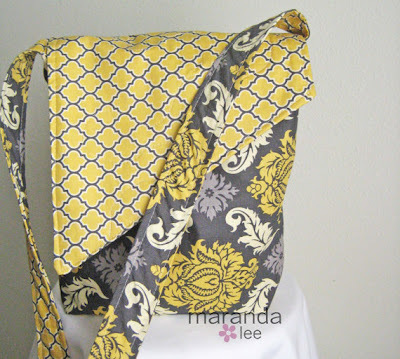 The winner will choose their fabrics (inside, outside, and flap) on Maranda's website. To Enter: Post a comment with (1) an Eighty Twenty recipe that you have tried and NOT liked (go ahead- I can take it- but you must state WHY) OR (2) a recipe that you think should NEVER be health-ified (ie: stay a 20 forever). No entries after 5pm MST on Sunday. PLEASE include your email so that you can be notified should you win. Only one entry per person (no, Mom, you cannot enter). The winner will be chosen at random and announced Sunday night. I think any type of brownie recipe should just be left alone. They are such a rare treat, that I don't mind that they are all twenty. BTW... I love the bag!! Gorgeous. Love the bag-love her fabric choices. I don't think Ice Cream should be healthified. The more fat (cream) the better. I believe strongly...that you cannot go skinny on mac n cheese :) Something about the full fat versions that are soo much better! Cheesecake is the one thing that is better the less healthy that it is! The more blocks of cream cheese a recipe calls for, the better! Peanut butter should never be fat-free!! I tried the phyllo chicken chimichungas and the chicken turned out delicious, but we weren't big fans of it wrapped in phyllo dough. Wow what a beautiful bag!! Any kind of FONDUE is something I think should never be lightened up! :) I love going to the Melting Pot for decadent fondue (of both the cheese and chocolate varieties) and I savor it slowly knowing it's a major treat. Mayonnaise should stay a 20. I would say that french fries should never be healthified!! If you going to do it, do it big! I'm new to your site so I haven't had a chance to try any recipes yet, although I have quite a few bookmarked to try. I think ice cream should be left alone. If you're going to eat it, eat the real stuff. This should always be a 20! Sometimes working off the extra calories are totally worth it, and classic comfort food shouldn't be "healthified". It is cheese for crying out loud! Love the bag! Ranch dressing should never ever ever be made low fat. It just never works out or fills that same craving! I hate anything low-fat. How about just consume full-fat/full-calorie foods in healthy amounts?!? Love your blog, and the 80/20 idea. I've never seen a healthified version of good ol' pecan pie that didn't look like a sad fake, that's just something that can't be replicated with fewer calories. I have been visiting your site since I made a lifestyle change to eat healthier and lose weight! I have now lost 31 lbs and still eat great thanks to blogs like yours! I have to say I haven't tried a recipe of yours that I haven't enjoyed. But, I have to say that the enchiladas from your ex-boyfriend's mother :) came in second to the Kraft Recipe I have been using..... Also, I don't think that a cheesecake should ever be healthified! :) Thanks for the giveaway, I have been admiring her AMAZING bags! Love them! I did not like the Fried Rice Quinoa. The flavor was good I am not sure I like the texture. It was the first time I have ever tried Quinoa. Fudge... fudge simply should be the goodness that it is. I was disappointed with the Hawaiian Pesto...I was really excited for it, but I think pesto really needs basil, and I wasn't thrilled with the idea of adding cilantro. I think I would try it again and swap the cilantro with basil - or maybe just take the cilantro out - either way, I'm up for trying it again! Macaroni and Cheese is something that I just can't get by with changing and making healthier. There is just something about the "full" version that is never truly replicated. Love your site, but I haven't tried many recipes yet. I would have to say don't mess with my chocolate chip cookies! I like to make "healthy/nutritious" cookies, but when craving a cc cookie I want the real deal! Super cute bags, I just might be ordering a few as Christmas or birthday gifts. I haven't made a recipe I didn't like yet probably I only try the safe ones. And I would not mess with an 80 version of chocolate cake or any type of cake for that matter. I'm really enjoying this blog! I would say that mac and cheese and grilled cheese should not be healthified. Everything in moderation! I don't think Ice Cream should ever be healthified. It needs to be super creamy or it just doesn't hit the spot!! Apple pie, it is so classic and such a comfort food. Just needs to be the way Mom or Grandma made it. Chocolate croissants should never be healthified. The rich buttery delights remind me of my time in Paris and they just wouldnt be the same if they were altered. Your polenta cakes needed SALT! And I think cheesecake shold never be tampered with, the more fat, the merrier. I'm pretty new to your site, so I've only made your Quaker Who? Granola Bars, which were good! I made your Baked Chicken Phyllo Chimichangas. I loved the chicken but wasn't a big fan of the phyllo. I have made several other recipes and they have been great! Love your site! I had to scroll through your recipes as the ones that I've tried I've liked and come back to often. I brought the bloody mary mix to a family event and I'd say the response was average but not over the top. That's the worst comment I have, great recipes! I love your blog but have not tried any of the recipes yet. I think that chocolate cake should never be changed! I'm in agreement with people who have said that ice cream shouldn't be a 20. It's never as creamy as the real deal. Not a recipe, but bacon. Turkey bacon just doesn't cut it...if you can't eat the real stuff don't bother. (Callie) Two things I think that should never be turned into an 80 are fish and chips and the cream cheese frosting that goes on cinnamon rolls. Your site is great - love all the recipes. Creamy mac and cheese should never be healified. Lots of cheese= heaven.